So you have a shiny new website on your awesome new domain name, and you’re thinking that customers might not want to send emails to iwuz18whenIsetthisup@gmail.com. But you need the emails to be able to go somewhere, so, what do you do? 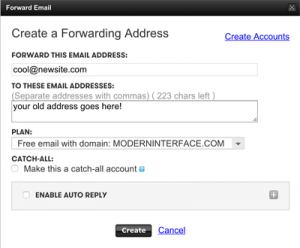 Forwarding – email forwarding is a straightforward process. You have: cool@newsite.com, and people send mail to it. Then it is magically forwarded to your old address. On Godaddy, it’s free with your domain name, and you click “manage” (on the email line) then “create forward”. Dedicated address – This is a little more complicated, and not free. You pay a certain amount, and are allowed to create an email address. Your provider then receives those emails and stores them for you. You can access the emails on all your devices, and through all sorts of mail setups. 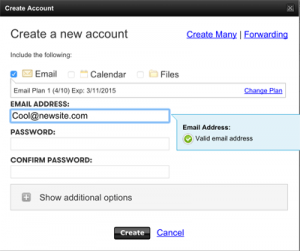 Setting it up on Godaddy: “manage” (on the email line) then “create”. So, what’s right for you? If you’re a heavy email user, who wants to be able to sync emails across all your devices, a dedicated address is the right way to go. If, on the other hand, you just need to check your email at the office, you can probably get away with forwarding.